If you are unable to attend the auction but still wish to bid, you may either leave an absentee bid or register to bid by telephone. Registration forms for either absentee or telephone bidding will need to be submitted by 10am on the day of the auction. In both instances, photo ID will be required in order to complete the registration. If you leave an absentee bid on a lot, this authorises the auctioneer to bid on your behalf up to your indicated maximum amount. When the auctioneer executes such a bid, the lot is always bought for the lowest bidding increment that exceeds all competing bids, providing it meets or exceeds the reserve price. If your bid is successful, you will receive an invoice by email on the day of the auction. 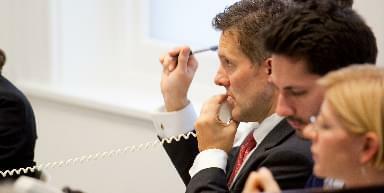 If you would like to bid by telephone during the auction, our trained telephone bidders will call you from the saleroom before your lot of interest. When you choose to bid, they will relay your bid to the auctioneer on your behalf. Upon request, we can arrange for telephone bidding to be conducted in most of the major world languages.